Alright. I did bad. I wasn't here to wish people a happy October. I'm usually the first! Dang! How time flies, sometimes! How could it possibly be the 4th of October, already? Yesterday, I came back from the river, and excitedly e mailed a friend, "The cutts are here! Get down here!" I had just had the most productive morning on the river that I had had, all summer. I could not keep my line in the water, without reeling in, yet another, big fat searrun cutthroat trout! And they were so wild and healthy! The minute I'd release them they shot back into the depths of the pool, like a rocket. I was only down there for about 15 minutes, and I had released 5 or more cutts. The entire time, I was giggling. The last trout took the hook too deep, so I reluctantly cut the line, and was left with my mono, flying in the breeze, no extra tackle with me, to tie up, again. So, I headed to the house, to share the good news. Bill immediately rigged up, and headed out, himself. A friend drove from Portland. The party was on! So far this season, the biggest T bay fish for us. #32! However, I had to go to the doctor, so I couldn't join them. When I got home, I asked about their wonderful fishing experience and was met with a blank stare. "Uh oh. You didn't catch any fish?" I just don't get it! Why on earth would they be ravenous one minute, and totally hide from us, the next? Was it all a dream, or did I really catch all those trout? Sometimes, I stop to wonder! "Maybe it's just the girl thing." I giggled to Bill. My credentials were falling fast. I wondered, deep down if he even believed me. Or, was I seriously losing it? Had day after day of no bites created a fantasy world in my own mind, where all the fish in the world danced in my head, and the morning was all a dream? I don't think so, because if it were a dream, I'd be fishing with a 3 weight rod, and a huge chinook salmon would come out of nowhere and grab my reverse pink spider and jump out of the water and pull me in, with him. That didn't happen. They were just cutthroat trout. Thus, my morning was very real!!! I can't help that the fish were on the bite, and then they weren't! So, to make it up to my friend, Shane, I cooked a wonderful crock pot roast, called my son David in, and we all sat down to a wonderful Fall feast. The clouds in the sky cast a coolness to the air. The wind is brisk, and the trees are nearly stripped of their leaves. Sometimes, the trees in fall and winter remind me of Degas dancers, tall and skinny. Skeletons, casting spidery shadows over the meadows, bending, ever so slightly and slowly in the breeze. With only sparse and occasional patches of leaves, now, they are cold and bare. So many things lately, remind me of my surgery, last winter. The powdery light blue of the sky, the closed doors, as I look outside, my nose, cold, against the glass windows. The longing for a warm fire, in the wood stove. But, this year is different. Even though the cold wind warns against it, this year, I can bundle up, and go out and play in it! No messing with awkward wheelchairs, and energy so limited that I can only make it halfway through the yard! I am free to walk all the way to the river! And, what a blessing that is! One day this week, as it rained hard, and thunder and lightning danced across the sky, I walked to the river four times! I couldn't help myself! I was looking for signs of salmon! "Are they here, yet?" I was met with the song of my hilarious bird, but not a sign of a salmon, yet! All week, since then, my rubbery and sore legs have reminded me that the doctors told me it would be a full year to recovery. They weren't kidding! Even walking that short distance in repetition has been a challenge. But this Fall and winter, I will be getting better and better each day. My one year anniversary will hit in December, and I have Christmas to look forward to, during that time! I am going to celebrate, like none other! Last year's Christmas in a wheelchair brings memories that I have to erase! I'll never forget! I was alone with the boys, and tried my very hardest to cook a full Christmas dinner, from my padded seat. I ended up with a cutting board in my lap, trying to cut potatoes. I was soon bent over in tears! This will not happen, again! So, with Christmas fast on the track of getting well, I welcome the cold clean air of Fall like the gift of a new beginning!. Let it snow! Let the salmon begin to collect in the rivers! Let Thanksgiving approach and fill the air with the smell of roasted turkeys! As I sit by the side of my favorite hole on the river, one single very large maple leaf drifts down from a tree, and lights like a spider, scooting across the river. Ladies and gentlemen, start your engines, please. Fall is here, and I'm going to race into it! Off to Portland I go, with two boys in tow. They are going to go to the concert, "System of a Down" whatever that is... (and please don't tell me. I don't think I want to know!) All I know, is that it's not the Oregon Symphony! Thing is, I can't drive at night, so I'm taking them as far as Andrew's new apartment, then they are on their own! Andrew's roomate drives, so they have it handled. I'll never forget last rock concert. I went to pick them up, and arrived early. It was at a place in Salem. The doors were open, there were kids, obviously high on drugs, and I had this terrible feeling that I wanted to go in and drag my kids out of there! However, they came out, safe and sound, and were obviously not with the group of kids that were so wild and untamed. Whatarelief! Life is scary. Sometimes I'd like to keep them here, living by the river, where no one bothers us but the deer and the elk and the raccoons. Frankly, I think that nothing in the world will scare them back home faster, than living in that fast lane. I know it did, me! It's kind of interesting, watching their journey through life. I just watch, and pray for their safety, knowing full well that I've done all that I can, to instill what I feel are the important things in life. I know that to be true, in more than one way! Oh yeah-- Bill and I fished Memaloose for a little while, yesterday and had great luck! Bill landed a beautiful 32 pound hen, and I, an 11 pound buck, complete with sea lice! It was so bright! You can see Bill's fish, here. Parking was an absolute nightmare and trolling was a zoo. Still, it was fun! It was another day that I didn't want to go, really, so both fish are all Bill's fault, again. I played fish two days in a row, and let me tell you... I can't do that, yet. I am so tired, and so sore! But, I have a smile on my face, and that's what is important, yes? The boys had a great time at the concert. I'd just as soon not think about mosh pits, but I was not kept from the talk of all of the exciting details, on the way home. Let's not discuss David's head injury, while crowd surfing, OK? The trip there was non stop boy talk, in between a couple loud sessions on the cd player. I'm becoming known as the "cool" Mom, who not only allows, but actually enjoys some of their music. Mind you, I said, "some." The last of my raspberries are getting a little moldy. They are beginning to lose the flavor of warm sunshine. Now, they are taking on the taste of clouds and fog, and damp winters. Still, they have a hint of raspberry left to them, and the texture is the same. It's nice to wander out to pick them. Soon, the garden will become just another bramble in the fields. Kilchis loves my raspberries and begs by my side, or watches for ones I drop. I took a walk by the river after we had our garden breakfast. I tried to get to a high point, to check for signs of salmon, but did not see any, yet. As I stared into what is the clearest river I've seen all summer, I thought to myself in wonder. There are actually fish in there! Not salmon, but trout! Fishing, I decided, is the adult game of "Pop, Goes the Weasel." It brings out the joy of a one year old's 'honest to joy' grin, while playing peek-a-boo. There is absolute wonder for all, when seeing nothing, and having your bobber go down! The absolute shock of a "weasel" (or clown, etc.) popping out of a box, when nothing was previously in sight. The other day, I could not believe my eyes when my fly took a sudden jolt, and I pulled towards me a 17 inch cutthroat trout! It was magic! Pure magic! I could see the outline of every rock, every leaf that swirled to the bottom and came to rest in a watery block of patchworked fall carpeting! And yet, I saw no living creatures! Their camouflage abilities are amazing! Midway through the playing process, I saw it! The flashes of silver that attacked my fly was a living, breathing creature that came out of seemingly nowhere! As I held it to hand, I sucked in a quick breath of amazement. It was beautiful! The tiny black spots on it's back and the pink blush on the underside of his jaw mesmerized me. I let it go, and it rushed back to it's watery hiding place as quickly as it had come. Do you ever get the feeling, "Did that really happen?" while catch and release fishing? I sure do! And the "just one more cast" is the same craving as a child, wanting to wind that Jack-in-the-box up, once again! To be able to pull a live pigeon out of a scarf is an amazing feat, but likewise, a cutthroat trout out of crystal clear waters, where seemingly, there was nothing before! While in Portland, I had a very nice dinner with ifish member Reeldick. We talked about just about everything, (except golf) and I was back to my motel room and tucked in, by 10:00 PM. The next morning, I had breakfast with my Dad. It was then that I got my dose of golf talk. What is it about golf? There is nothing magic or amazing about golf. You can see the ball at all times, except when you are successful in hiding it in one of those holes in the ground. There's not anything to be amazed by that, because.. you know.. I know where the ball went! Now, those water hazards... those! Those hold magic and mystery! If I ever go golfing, remind me to take along my favorite rod. I'll show you magic! Watch what I can pull out of that hat! Still, breakfast with my Dad was wonderful. We both ordered oatmeal, just like we had together when I was little. I still love it! We laughed, told jokes, and you know... talked about the good old days. It's off to pick a mushroom or two (dozen!) this morning. I doubt I can do much hiking, so it's road hunting. Good thing that it's legal to hunt 'shrooms from the car, huh? Maybe tonight, some cream of chanterelle soup, or a big pot of my favorite spaghetti. It's winter. The fish are full in the bay, and soon... very soon... it will be magic salmon I'll be pulling from the Kilchis! I can't wait! I'm too lazy to start October's journal on ifish, so my column is especially long, today. Yawn. I'll archive October tomorrow! Meltdown! Last night I was having fun pushing online buttons, trying to improve my computer's performance. Why don't I leave well enough alone? I'll learn, someday! One of the tests had me reboot. When I did, surprise! Windows said I hadn't activated my product, (which I had, three years ago!) Norton said "auto protect" was disabled and Microsoft spyware, which I rarely used, was in the system tray! OK, there is more! I couldn't connect to my network! It wouldn't acquire a network address! Argh! You guys and gals all know how this feels, right? It makes you wonder why in heck we use these things, and as you lay your head down on the pillow, totally frustrated and giving up, you think your life would be better without them! Right? Well, I finally got back online, thanks to the help of Skrimmy, the local ifish expert on not only fishing, but networks! Thank you, Skrimmy! Instead, I need a day on the river! I have planned a day on Tillamook Bay with my brother, and a business guy who is going to counsel me on what other? Business! He's involved with SCORE, which is a group that helps new, young businesses thrive. I want ifish to thrive and I want to go fishing! So, all looks good for today! They say you are never supposed to mix business and pleasure, but never did I hear anything about business and fishing! I'll worry about this heavy block of whirring machinery, later.... much later! For now, I'm going fishing! Bill and Tim, hard at work. Had a great day on the river, yesterday. 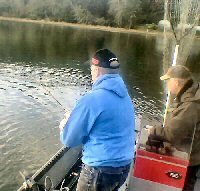 We had my brother David, and his friend Tim from college in the boat. Bad initial introduction, though. David walks up with a Ducks sweatshirt on. Both David and Tim are die hard Ducks. Bill is a dedicated Beaver. I just sit on the sidelines and giggle. David not only had one Ducks sweatshirt, but when one got dirty, he put on another. By the end of the trip, both were soaked in salmon blood! I think that made Bill happy. It was really slow for most, yesterday, and has been for most of the last week. However, we were able to land a nice 20 pound fresh buck, a bright as a nickel silver, and an accidentally snagged big old 40 poundish brute that we released. (Along with my very special Tim Juarez spinner!) Man! That spinner had caught fish! There are more like it, but that one... that very one was special to me! It really hurts to see a fish swim off with it, in it's side. If anyone catches it, please return it to me! I'm offering a reward! You keep the fish- I keep the spinner! Put a Duck and a Beaver in the same boat, and they can both catch fish! I woke up giggling in my sleep, this morning. Have you ever done that? You know it's going to be a good day, when you do! All night long in my dreams I was fishing in one place, or another. Guided trips, for free! The last I really remember in those dreams, I was fishing with Jim Erickson and my brother. They were both trying to tip the boat over and tip me into where these little baby snow crabs were crawling all over, in the shallows of a bay. That would be just like my brother, you know. He used to chase me in the boat with dungeons crab when I was little. He even got me one time! What a creep! So, I took this big gulp glass and filled it with icy water and baby snow crab and threw it at them and ran up the dock! I guess my giggles woke me up. What a great night! There were baby crab crawling all over both of them! I remember fishing for sturgeon, salmon and tuna! And I'm not even tired! Dreams are awesome! I was thinking last night how blessed we truly are. No matter what happens, during the day, we always have our warm beds to return to, at night. You know, with all of the terrible events around the world, many do not have that luxury. I spent my evening thanking God for my warm bed. I attended my son's Fall concert last night, and man oh man, were they good! David had an awesome solo in the jazz band, as did his friends. I don't usually enjoy choirs, but last night, the Tillamook High School choir rocked! The whole thing was awesome! Attendance was unbelievable. One thing about Tillamook-- It's one big family and we show our appreciation for our young musicians in a big way. The auditorium was packed! David did so well. I'm so proud of him! When my kids do well, I feel the most wonderful satisfaction and pure joy in life, and likewise, when they disappoint me, my life falls into shambles and I drag. They are a mirror to my moods, and a direct extension to my pride and well being. Meet us before hand, and get your ifish name tag! The info for that, is posted here! There is no spring chinook closure, folks! Not a proposal or otherwise! Seems my life is just full of laughs, lately. Yesterday, I was kept busy giggling all day, as the news on channel 12 progressed. Seems that right before I left, one of the moderators on ifish, Crabbait, wrote a joke thread, regarding the ODFW state of chinook fishing. It is here. Channel 12 news picked it up as a factual story and reported that after January 2006, springer fishing will be closed! I couldn't believe it! Seems that the First (yeah), Live (yeah), Local (yeah) Accurate (nope), Timely (nope), Reliable (nope) news stations is posting fact strictly off of an internet chat board, without checking the sources! Could it be? It could be! They really did it! I called the news desk myself, yesterday morning when I heard. They had reported it the night of the meeting on their 10:00 O'clock newscast! When I called, I identified myself and I got a bit chewed out. He said, "Looks like someone was being deceptive on your web site." I said, "Looks like someone else should do their homework!" I cannot IMAGINE posting something without verification of any kind except... a chat board? He spit at me, "Why didn't you retract it?" I replied, "I was at the meeting. Why weren't you?" So, why weren't the news folks, there? Too busy reading ifish? All day yesterday, they had a retraction on their web site, but then last night, low and behold they broadcast another error regarding it! 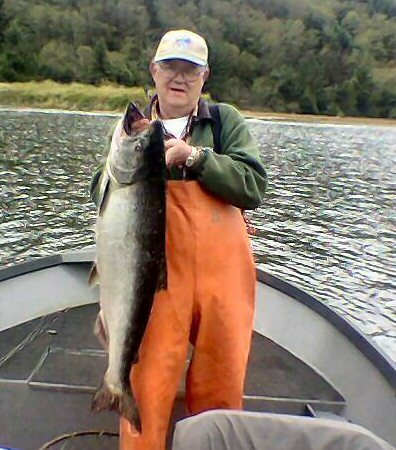 They reported that the ban on sportfishing for salmon on the Columbia is "just a proposal" and that is different from what they told you last night. They said it still needs to be approved by Fish and Wildlife. If it is, that ban would not take into effect until January. There IS NO SUCH PROPOSAL!!! People, it was a joke! Pete called the news desk trying to get them to check their sources, and they just swear that ODFW gave them this information! However, they could not name their sources. They said "they'd look into it." Bah! I think it's a sealed deal and they are done with it. Now that is sad! They have lost credibility, and now I worry if they'll even report again, regarding this issue! Ladies and gentlemen of the media, we need to get the word out! Putting aside all humor, it appears that information surrounding the allocation issue has not been brought forth in a manner to provide maximum public involvement by the traditional news sources. It would seem that both the public and local news outlets rely upon www.Ifish.net as an important source for information. In this instance, the need for information has created an inaccurate report. For this reason we will work further with both ODFW and WDFW departments, to include our online community, www.ifish.net, in more depth during this ongoing process. Please stay tuned to ifish for the facts! ...and Crabbait, I don't know whether to hug you, or kill you! Your post was effective. You were able to achieve maximum attendance! But, next time, let's try another tactic! I am so anxious to see the river, this morning! This year has been so different from the past years. The summer was extraordinarily dry. When the rains came: one day, 3 inches in 24 hours, I thought for sure the river would overflow its bank! However, it spent all of it's energy simply draining into the dry and dusty summer earth, and the river collected very little of it. Usually, we have enough water in the soil that a rain like that in the fall would bring not only raging waters overnight, but salmon jumping over the riffles, for all to enjoy! This year, it is an act of patience. A day by day progression. Every day, rain or not- the soil leaches a little water to add to the river's volume, and each rain brings it up just enough so that we can see a slight difference. It's like watching my orchids bloom. Slowly, surely and... did I say slowly? Yesterday, it finally turned to a real river. However, it's full of sticks, leaves, and fallen forest debris. Golden orange needles cover and slowly swirl in the back eddies. It amazes me to see the water so accurately mirror the colors of the trees, above. If you watch long enough, huge branches or logs that dried on the beaches for the summer are picked up and swept downstream. Some are fresh fallen from the wind and quickly swept out to sea. The storm hit the other afternoon with a vengeance. Out of nowhere and forecast for later that night, it hit without accurate warning, at noon. The trees bent over at their trunks, the tops of them danced wildly as I sat protected, staring out the window. Wow! The powerful force and long absence had me stunned. What energy! What strength! What a Mother of Nature! What an awesome God we have! I love it when I get an emergency email alert from NOAA, regarding a storm's arrival and it hits before, or after. After the fact, I giggle as I receive an update, correcting itself. Often I've thought of becoming a weather spotter. I could do better than they do, at times! The storms that hit in the Kilchis valley differ so widely from what is forecast. I have an anemometer, and it rarely displays an accurate wind direction. Living in a canyon, our winds swirl in bizarre direction, somewhat like a tornado. If we are forecast a South wind, I can watch the wind data at Garibaldi, accurately South, and yet sit at home in relative stillness. The South winds don't touch us on ground, but scream overhead, instead. All is calm, all is bright. I'm protected, down in my meadow. I wanted to introduce to you a new product that I'm find useful. Not only useful, but darn cute, too! functional tool. I keep mine in my pocket and I really enjoy having it. I find myself repeatedly grabbing for it, while on the river. 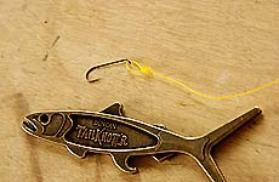 The Tailknott'r is a great stocking stuffer. I'm starting all that shopping for Christmas, now! There is no way that I'll be caught having to do it two days before, like usual. That is so tiring! I'm starting now! Not only will I be prepared, but I'm enjoying the process and starting my celebration early! And now, I'm counting the minutes till daybreak. I was so excited this morning, that I woke, before 5. I just can't wait to see what the river brings, this morning! It's from the new Sheryl Crow CD. I love her music, but this one makes me sad. Why does it have to keep repeating in my head? Just because it's so melodic, or because it hits home? The river is going back down. It seems it just won't keep fishable! When will Fall happen? Is it going to be another year where the river is perfect for escapement and not so, for fishing? In a way, that would be good... for the fish! The fish need good, but come on! So does Jennie! I saw a license plate one time that I just adored. In it's bold lettering, it said, LISTEN! I love that! What better message? Listen to the sound of the leaves falling from the trees, when there is no wind. It's the sound of summer, falling from the sky. A gentle sound, almost unperceivable. If there truly is no wind, they fall so softly, so slowly, and when they hit ground, it's as if a contest to see who can make the smallest impact noise! Sometimes I go outside and sit, and close my eyes. I listen, to all that is around me. I have memorized the sound that leaves make, and it delights me to be able to see it, in my mind's eye. Yesterday, I sat anchored in a boat. There was not a hint of wind in the sky. Everything was totally still. But yet, leaves fell from the trees around us. As they hit the water, they made the most delightful little spray. It makes me smile. A delicate landing with tiny water drops scampering across the water. It's very near to what a smolt makes, when it jumps. Condensed raindrops fall from the trees and create a very similar water ballet. LISTEN! You can hear those, too! Sometimes, a ghost like wind will come out of no where, and a leaf will get caught mid air in it's push. The very tips of a large and arched maple leaf lands on the water in front of me. The wind picks it up and carries it, scampering across the water like a spider. Funny, I never see these spidery forms go under. They are always too far downstream to watch that part. But, I know that soon they absorb all of that water, and go down, down, down, to join one of the many colorful patchwork collection quilts, where God has created the most beautiful river carpets. As the rains come on, and the river rises, those patches of carpeting begin to move, slowly, and swirl in the increasing current. It's like they come alive! Lifted from their watery grave, they are swept downstream. During this parade of high water, the leaves often cause me to curse, as I try to fish a piece of open water, and instead find the water thick with leaves and tree debris. It's the parade of summer out to sea, ever to be buried, broken down, and washed away to welcome winter. Our lawn, which is more like a meadow field, is full of leaves and debris if we haven't had a stiff wind. But there will be no raking at our house. First, because I love the looks of all of the leaves, but second, because the winds that we experience here swirl in a fashion that auto cleans the entire yard! It really is amazing to have a self cleaning yard. After our wind storm the other day, there is not one collection point of leaves! They swirl around the yard in big flurries until they find a trail down to the river, and follow the exits as if we'd planned it that way! I spent yesterday picking the rest of our acorn squash, and putting to rest dahlia and begonia bulbs. The garden has come to an end. I was still able to pick a raspberry or two from the vine, but today I will have them pruned back, with huge hopes of abundant crops next spring and summer. Winter is marching forward around here, at an alarmingly fast pace, but the river seems to be lagging behind. The Kilchis is again, low and clear. The cycles it's been through this Fall seem to keep fighting against a full winter's flow. I have yet to see the water rage, and the current strong. It rises to a barely fishable level and then begins again, to recede. Glancing over one of our local bridges, I spotted 12 cutthroat trout, but not one salmon! Usually, this time of year, I'd see a salmon or two, or three! Where are they? Why is everything seemingly late, this year? "Patience!" I keep whispering to myself. "Patience!" You can hear them in the river! The salmon! Spawning in the riffles! ...and the rain falls silently in the night. I didn't even hear it, but when I opened the door to let the dogs chase the raccoons, the back deck was black and wet. Sneaky rain, anyhow! The rain gauge reports .05. Yesterday was so beautiful and full of sunshine! Yesterday I walked out to the river just to waste time, and to give Kilchis a run. Click here for the results! What a blast! Last night, as I dozed off to sleep, visions of big fat cutthroat swam in my head. They are so much more beautiful than a Fall salmon. So alive! To think that this particular cutthroat was nearly five years old! Wow! Imagine that in a steelhead! A trophy! You'd think that a Kilchis river cutt, five years old would know better than to bite a K16! What would make a cutthroat so aggressive at 2 in the afternoon, with the full sun shining on the water? I spent the day hovering over and nurturing a pot of spaghetti sauce. Yesterday was just the day for spaghetti. It looked that way when I got up in the morning as I built a fire. Last night, as I finally poured it over some steaming pasta and grabbed a slice of garlic bread, I knew I had been right. There are just days in late Fall that are designed for spaghetti! I spoke with my son Andrew, yesterday and he is wanting to move home. He dislikes college as much as he thought he would. I have mixed feelings about this. Sad that he doesn't like college, but really not surprised. He says he can do the same thing at home, and go to our local community college. It'll be nice to have him home. He was thoughtful and fun to have around. I miss him bringing me hot chocolate before bedtime and surprising me with hot brownies from the oven. He appreciates good food, and since his departure, my cooking has been rather dull and unexciting. No one around to appreciate the finer things in life... David is happy with a bowl of Fruit Loops. Andrew likes feta and gorgonzola and garlic! Pine nuts and pasta and butter! And so, Sunday comes and the rain falls on the Kilchis river. Nothing much to get excited about, or report. Life is good when it's boring. Think I'll go start a fire. There is a brief moment before the cast where you wonder if you should tie your fly on, again. You know the feeling. The doubt that it would hold, should you catch a big fish. The realization that the knot probably isn't the strongest you'd ever tied, and that should a large fish grab hold of it, it just may come unraveled. What a pity! It was the most beautiful fish I'd ever hooked on a fly, and who knows what it could have been. Frankly, it could have been just about anything! If it was a cutthroat, it was a trophy. If it were a silver, it would have been my first. If it were a chinook jack, it would have been my first on a fly, also! Darn, that knot!!! After I felt that deep pull, and the fish shot out of the water like a rocket, I began to shake in fear, rather than hold tight with the confidence that I'm accustomed to. Sure enough, as the fish landed back in his watery dwelling, my line shot back at my feet with enough power to lob another cast. Instead, it circled around me, and fluttered lifelessly in the current. I bent down and grabbed for the tippet. Sure enough, there, in my lonely little hands was the curly and pitiful reminder that I should always tie my flies tightly and test them, to boot. You'd think I'd know better. But, my hands had been frozen, and it was my last cast, and... and... and!!! Darn that was a pretty fish! I didn't bother retying. By that time, my legs were getting wobbly from standing and a sort of terror came over me. Can I even make it back to shore? I have to be careful! My legs are still recovering, (I hope!) and standing is not yet my forte! Jennie, you're lookin this all wrong. If you would have retied, it may have changed your presentation just enough that you may not have hooked that fish at all. It may have been that curl in the leader that enticed the fish to strike. And so, I must think of it as this. We are SOAKED!!!! Talk about living!!! We thought we'd put in and do a couple hours fishing. I can't fish long trips, but it seems that short trips fit in my schedule anyhow, thanks to Bill. As we left the house I asked, "Do we need rain gear?" Bill said no, that we'd just quit if it got nasty. It was sunny at the time. Rain? Where? The sky was mostly blue. We have fished several times like this and never had to quit. It happened. Midway through our trip, it started to rain. We got out his emergency poncho and shared it between us. Having never had to use it before, we didn't realize that it wasn't really waterproof! Our lines had been getting hit since we anchored up. One after another our lines danced! Of course we couldn't leave now! So, it kept raining... we were getting wet, but nothing bad. The anticipation of the next takedown kept our mind off of the weather. Then, Bill's rod took a big dive! Whoo hooo! Fish WAY on! This was a biggy! Just then, the sky opened up and the hail just started hammering us! For just a brief second, I started getting the big lower lip. I was freezing! I said in a kind of whiny tone, "BILLLLLLL!!!!" He looked up from his business with the fish, "Well???!!! What do you want me to do? I can't lose your ifish Kwikfish!" I looked around me and decided he was right. What COULD we do but just enjoy life whatever it brings? There was no shelter anyhow, no where to go! So, amidst the pouring, beating hail, with a huge fish dancing on the end of Bill's line, I held my hands up, soaked to the bone and let out a full whoop! "Hey! I'm alive! This is really living!" I fully expected the darkening sky to break out in thunderous applause. It didn't. There was no thunder in reply, but dang... Even though my clothes were soaking and I was shivering cold, I decided that I was having the time of my life! It doesn't get any better than this. Sometimes fishing is just totally miserable! But, it is that very misery that reminds us just how alive we are, and how darn much we love to do what we do regardless of the conditions around us! If the fish are biting... who cares about anything else! Besides, I got this awesome e mail the other night, and I wanted to share it with all of you. Here it is! Congratulations to all online fishers! We are making a difference! Ahh.... DHCP problems. What is DHCP, you ask? I don't know! All I know is that I keep getting DHCP errors. By this time, I have totally turned my computer inside out trying to isolate the cause, which is probably caused, actually, by Charter Cable. But, alas, they cannot locate the problem. So, you know the drill... you take it upon yourself to totally screw up your own registry, thinking surely it's on your end. The Charter people said so, right? The Windows tech says it's Charter's fault. Charter says they just don't know. They fixed a tap in the line, they replaced my Netgear router, they replaced every cord, but still, the error pops up, "Network cable unplugged." It's NOT unplugged! I really don't think it's my problem, because it happens to all of the computers, here. Oh well, I'm tired, (more than tired) of trying to fool with it. I'll just live life with an expensive connection that doesn't stay connected. It gives me more time to fish, right? The river was absolutely prime, yesterday, except for the leaves in the river. They were thick! I waited until afternoon, not taking into consideration the brisk wind that blew up around noon. More wind? More leaves! It was even thicker soup by dusk! I was scared off the river in the morning when it was perfect by thunder and lightning. Not good to be holding a lightning rod during an electrical storm. Nope! I hurried to the house for protection. This morning I woke to .80 inches of rain. Surely, the river is now blown out. Half of me praises our Father above for the easy escapement for the fish, and half of me pleads for just a day of backyard catching. You know, when the fish are holed up in pools and resting. Waiting for the next rain... Waiting... for Jennie's offering on a stick. A big glob of eggs, perhaps a wiggling Kwikfish? A wickedly sharp spinner? I'll let them go, I promise! I just need to feel their weight at the other end of my line! Regardless, I enjoy the changing of the river. As I stepped outside to lock the chickens back in, last evening, I stopped. I heard something that was new to the season. The river, at full flow. What a beautiful sound! I stood on my porch and took it all in. Last night, I wrapped myself in down, preparing for a long winter's nap. I cracked my window open and lulled myself to sleep with the sound of the river's lullaby, and the rain, falling on the roof. Now, that is a recipe for long, hard sleep. Today, I'm ready to jump in to the day. Today will be full of surprises, full of life! And as the darkness fades and light creeps across the sky, I will be ready for the fish! DHCP errors, or not! Hey! If the river is high like I think, I'll need a heavy weight to hold steady my bait. My computer will work just fine for that! I knew it! The river is blown out and the lightning hit! Maybe it's a good day for a nice fire in the woodstove, and some rest. Andrew and David are home for Halloween! I couldn't believe how happy Kilchis was to see Andrew! It was so fun to have everyone wiggly happy, last night! Especially the dogs! You know, I've been missing my chair in my shower, lately. That's a weird feeling. I know that when I feel that way, I'm losing my battle to being well. I keep thinking of the guy who swims half way across the ocean, decides he can't make it, so he swims back. Only trouble is, sometimes I'm afraid I can't even make it back! This is true, lately, of walking to the river. I had it calculated that I could make three trips to the river, a day. That was in the heat of summer. You know, where I walk with flip flops, or light tennies. I carry a light fly rod, and put a plastic tackle box in my pocket with extra flies. That's it! I'm light, carefree! So, when the rains hit, I'd get up in the morning and plan my "three" trips. HUH UH! I've had to reduce that to one, or maybe two. I'd forgotten what it was like to wear heavy, wet, wading boots, carry 5 ounce plunking weights, or 9 foot rods and a jar of cured eggs! I'd forgotten that casting that much weight is more difficult, let alone should I catch a fish and try to wrestle him to shore! Lord forbid that should happen, when I'm fishing alone! I've stopped to wonder just what I would do! Is it legal to leave a 30 pound fish on the bank, while I go to find help to bring it to the house? Should someone see me, will they think I'm just leaving the meat to waste? I laugh to think I should cut the fish open and take the eggs with me, and leave the carcass behind! Oh my! Wouldn't that create a stir! Jennie the hen hunter! Why do I giggle at such nonsense? I'm a trouble maker, aren't I? I can't tell you, though, the fear that goes through my mind when I get halfway up the trail and feel that I can't go one more step. I've purchased walkie talkies to leave one on the counter, should I have trouble. Yet, I forget to turn them on, or even take them, I get so excited to go. I've yet to have to use them, anyhow. But, I'll tell you, whenever the sky turns that powdery blue and it gets really cold out, I look out the window and a chill goes through my body. Somehow, it's the memory of that sunshine that brings it all back. Thoughts of me stuck in a wheelchair, back during the middle of surgery episodes. I recall seeing that same winter sun shine, and wanting so desperately to go outside and feel it. I was so cold, all of the time! The sunshine called me so strongly! Just as strongly as the river calls me, now. Yet, I couldn't stand long enough to open the door, wheel my wheelchair out and sit on it. I'll not forget the intense struggle, trying to wheel myself out to make it over the door jam, while sitting in the chair. There is a rug outside the door that I would get stuck on over and over again, and once, all alone, I sat high centered on that door jam and the rug with the door open... totally stuck until someone got home to help me. I think it was over an hour... I don't recall, but it felt like forever. Thoughts like this... thoughts of me crawling up the back garage stairs because I couldn't walk... those thoughts... they haunt me forever. To add to the current winter's chill, all of those awful memories haunt me. It happens, every time I see that chill, powdery blue sky. And likewise, there is some kind of odd comfort that memories of my shower chair bring me. I'll never forget how good that warmth felt on me with the security of that plastic chair. Such a simple solution it was, to help me be able to shower without assistance. I have come a long, long, way. However, when the going gets tough, the tough get going... and sometimes, darnit, I'm tired of gittin' or going! It is so frustrating to work so hard trying to increase my stamina, only to be stuck mid field, with the rain pouring on my head, and no one in sight to assist me. Half of me doesn't want anyone to see me, anyhow, in such a compromised situation. My darn legs just won't move another step! My feet turn numb and I can't feel them. It makes me mad, and it's out and out frightening! And, it is at those times that I wish I had my shower chair back. At least then, I had no choice... but to just sit. Sit in a warm place, with the water running on my head, and no reason to feel it should be any other way. It was alright, and understandable, and I had an excuse. Now I look healthy, and people wonder why I'm having trouble. Thank God for my love of fishing. That very passion keeps me alive, I'm certain. The drive to get out to the river is what keeps my legs as strong as they are... even if they aren't as strong as I'd like them to be. I suppose all these thoughts come at a time as I'm getting ready to go for my 3 month check up at OHSU. I'll find out if I graduate to every 6 months, or continue on at 3. Wish me luck this Friday! Wish me well! Please! But, most of all, wish me that situation with a salmon on the bank, all alone! I want to laugh! I can do so much, really... that I have no right to complain. I will get stronger, every day. But just once, I'd like to put that chair in the shower again, feel the warmth fall over my head, and feel that wonderful sense of security without a need for an excuse.